Violets are one of the first signs of spring, a welcome sight as they peep out from grassy banks and the undergrowth in woody areas. At Tourrettes sur Loup they are centre stage in the local economy and also in the annual Fete des Violettes which takes place next weekend. 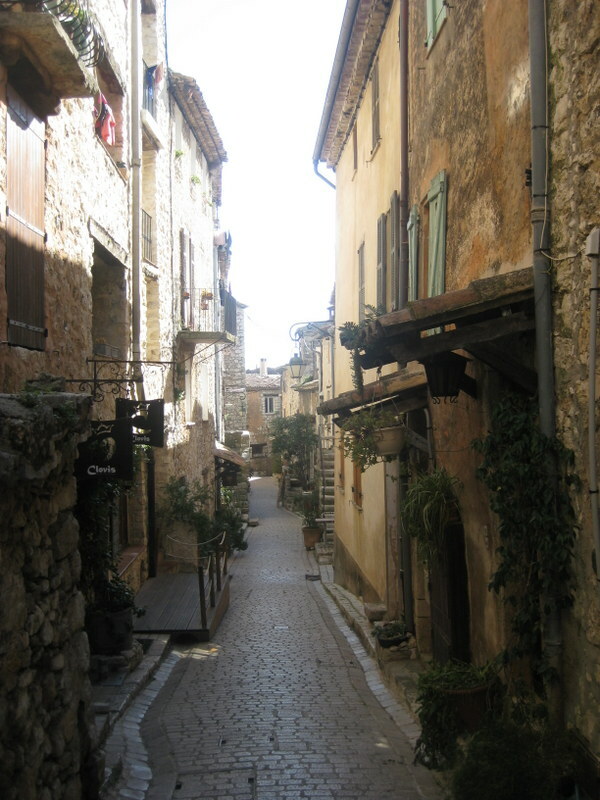 The village is a bit of a drive from Aix – it takes two hours altogether, down the A8 and then inland, winding up into the hills through Vence and across towards Grasse. But it’s worth the visit. As my French teacher said, it’s ‘France profonde’, off the busy tourist trail of the Cote d’Azur. Tourrettes is a village perché, built on a rocky spur, high above the river Loup. The medieval village was heavily fortified with its outer houses forming a rampart, and its maze of narrow streets designed to discourage invaders. Now they are taken over by painters, potters and craft-shops as well as little cafes although on our visit last week, many of these were closed. The Bastide aux Violettes however was open and it is a delightful small showcase for the flowers – lots of photos of the village in the 19th and 20th centuries and information on violet cultivation, symbolism and appearances in French art. The flowers are gathered for bouquets and to be used to make confectionery (there are free samples!) while the leaves are picked to make perfume. The tour includes a visit to a warm and fragrant polytunnel where flowers are grown in vertical towers. 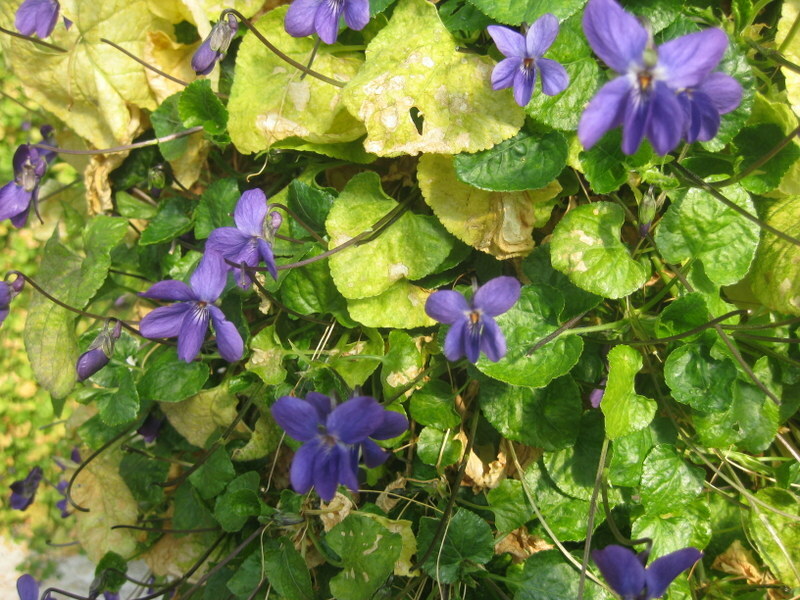 But around the village, violets are still grown in the ground on terraces where they are harvested manually. The Fete des Violettes takes place on Saturday 21st and Sunday 22nd February and includes a market, floral decorations in the village, music, a traditional dinner-dance at the Salle des Fetes, and on the Sunday, a battle of the flowers. Read about it here: http://www.tourrettessurloup.com/. Parking was easy in the main square but our visit last week was off-season. There are big car-parks just outside the village walls with free navettes into the square, and I suspect this is where visitors to the festival will have to park. 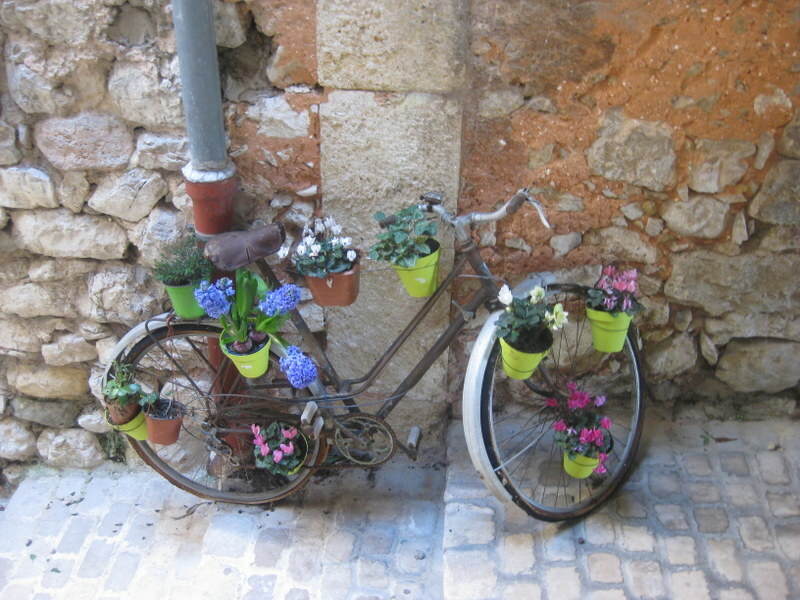 It’s a charming village, quintessentially Provencale, with the added delight of violets to enchant the visitor. I don’t know if you’ve been there but they have or had the world’s neatest candy factory there, and I don’t even like candy! No I didn’t see that…next time! Ahhh … I love Tourrettes! Somehow it has managed to escape the boutique-y feel of some other similar villages and one feels an authenticity to life there. I always enjoy a scoop of violet ice cream in the summer. The family-run olive wood shop (Bois d’olivier) is one I recommend constantly for the quality and prices of the products. How lovely to see your post here! Merci! I missed the violet ice cream as ‘Tom’s’ was shut. Will have to go back in the summer. Thank you for the info – perfect for my next visit.